To start, click the Create Instance button. 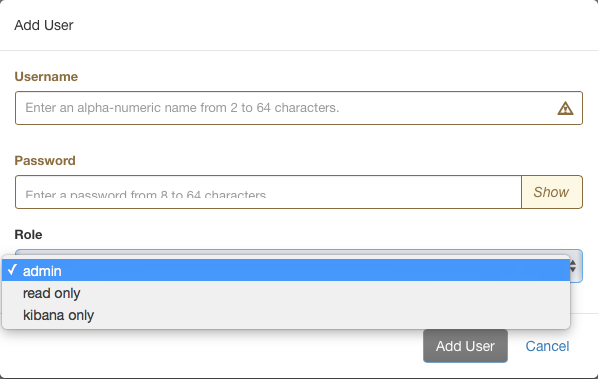 Select a name for your instance. This can be almost anything, as any alpha numeric string is valid. Select a Service, Elasticsearch in this case. Select your desired version of Elasticsearch. Select a zone that suits your needs. 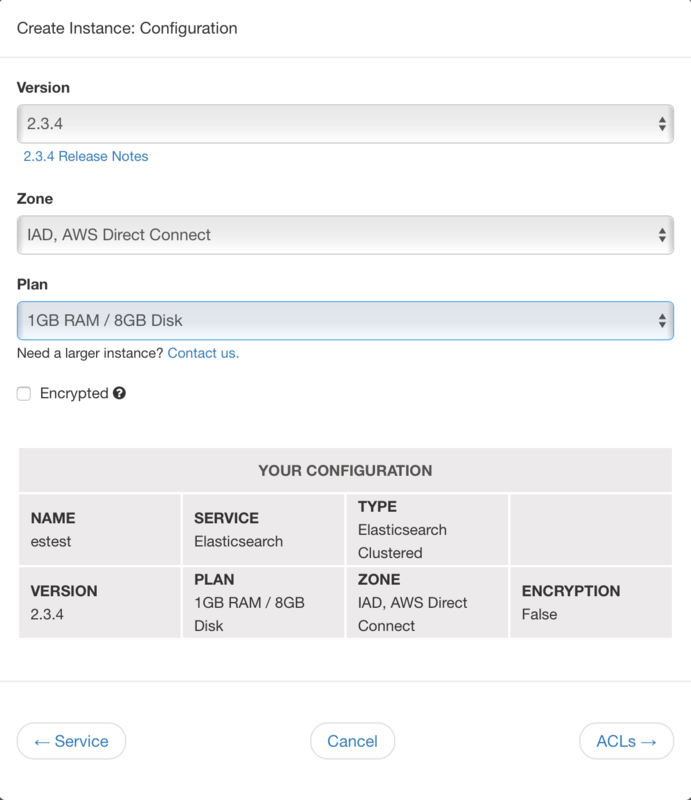 Zones are either Rackspace and/or AWS Direct Connect zones, labeled by airport codes in that region. Check out the zone map. Select the best Memory and Storage size for your application. For more details, check out plans and pricing. Check the Encrypted box if you would like to enable encryption at rest. Additional charges may apply, please check see our plans and pricing for more info. Verify your selections and click the ACLs button. On the Access Control List page you select the IPs or IP ranges you’d like to allow to access your Elasticsearch cluster. if you’d prefer to add these later, just select the box at the bottom, but keep in mind you will not be able to connect to your cluster until ACLs are configured. 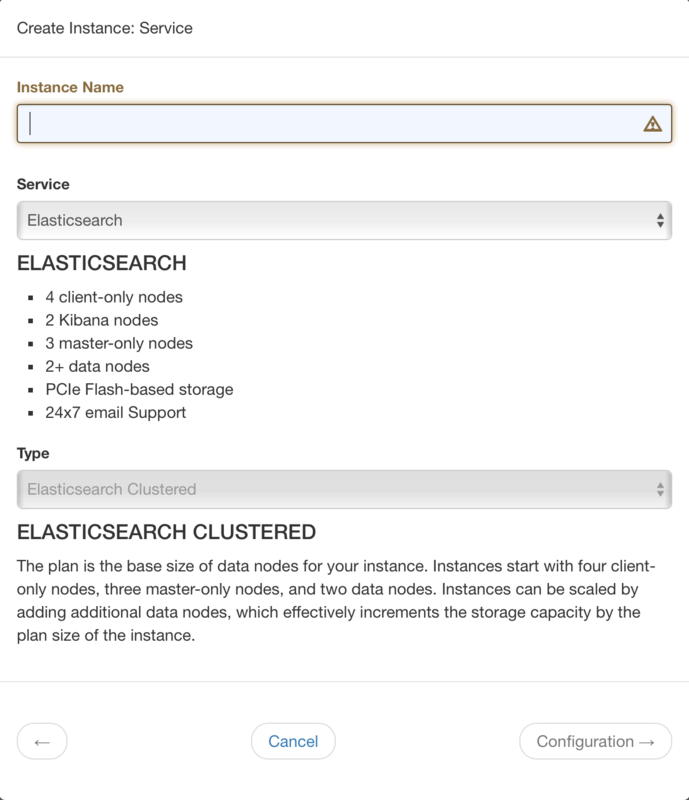 Select the role you’d like to add access for: Elasticsearch (REST API), Elasticsearch and Java API, and Kibana. Enter an IP and description, or select the Add My IP/Allow Any IP box to auto-populate the address box. You’ll now be routed back to the Instances page, where you can see the build status of your instance. Yellow means it’s in the build process, and green means it’s ready to use. Click the name of your new instance to continue. Under the Users heading, click the Add User button. Fill in the username and password, and for your first user make sure to create it as Admin. If you did not add any ACLs during the create process, or would like to add/modify more, you can do so now. Under the heading Security, you have the option to Add ACL. This is necessary as we don’t allow any access by default so you need to add any appropriate ACL’s for your servers connecting to ObjectRocket. There are three fields: ACL Role, IP Address and Description. Adding a description is optional but can certainly help if you plan to have more than a few entries. The default ACL Role of Elasticsearch allows access to the Elasticsearch REST API and any plugins. We also allow access to the Java API via the Transport Client library – select Elasticsearch & Java API to include this access. The My IP and Any IP buttons offer convenient shortcuts to add either your current IP address or to allow all IP addresses access to your instance.